A damp start to the day. With just a week left on site, and a good deal of that time to be taken up with planning and, eventually, the covering over of the site for winter, there has been an opportunity for site director Nick to gather some of his thoughts and to have an initial reflection on what has been achieved. Two of his aims at the start of the season centred on Structures Ten and Fourteen. In Ten, he had thought that the current Second Phase cruciform shape of the interior would not be a reflection of the Phase One interior. This has proved to be correct. By following the robber cut feature in the north-east corner, Jan and Claire have shown that the almost square form of the Phase One interior had beautifully rounded corners, exactly as predicted and paralleling the very special Structure Eight at Barnhouse. In fact, they have turned out be like the north-west corner, where a very large slab (perhaps of standing stone) defines that corner. In the north-east corner they have found two massive stone slabs, probably inserted in an attempt to counter the subsidence noted in other areas of the site. If that was the intention, it has failed. Both of the slabs have themselves tilted to a jaunty angle. Elsewhere in Ten, the removal of the north dresser is complete, without the discovery of more axes, and Sarah is beginning the large and laborious task of planning the north end, complete with its many levels. Dan and his team conduct magnetic susceptibility survey across Structure One. One of Nick’s other aims was to secure a plan for Structure Fourteen. Substantial stone robbing has removed large sections of the structure wall, but the wall line can be traced by the remaining stones and the floor deposits, as we mentioned yesterday, are intact. 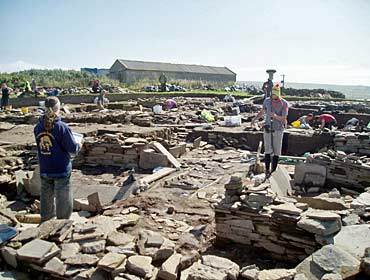 By yesterday afternoon, it was clear that, after the excitement of the previous day’s stone axe find, the work of removing the remaining midden and rubble was nearly complete. A complete plan of the structure, right across the floor, is now certain, meaning that the objectives for that structure have now been reached. More science was being thrown at Structure One in the form of Dan with magnetic susceptibility surveying of the second major phase floor, and, in Structure Twelve, a push is on to complete the cleaning for a major photo shoot and yet more planning. In Structure Eight, Jordan has finished taken his 123 XRF samples from the floor and is now completing the task of logging all the sample points by GPS. The results of this survey will be fascinating. 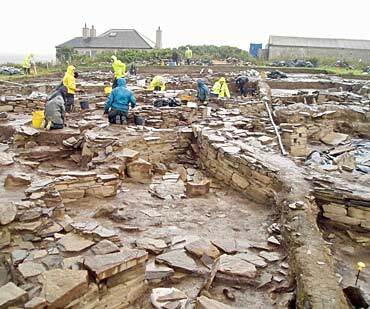 Remember, we are not digging on Friday and Sunday is our Open Day from 11am to 4pm with a continuous round of tours. All welcome. Removal of the central baulk across Structure Fourteen reveals the rest of the second hearth. My name is Nicki MacRae. 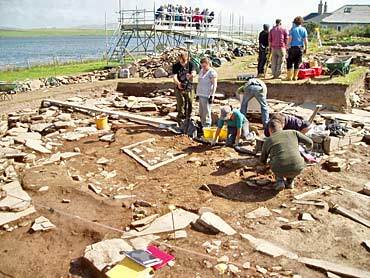 I am an artist (you can find my work at www.nicki-paints.co.uk) based in Easter Ross, Highlands of Scotland, and I have been delighted to be allowed access to the Ness of Brodgar excavations, this year, to study the site and the people involved in the project. I hope from sketches, paintings, photographs and film to produce an interesting body of work. I spent some time on site at the very start of the dig, and have returned, today, for the final week. It’s been really interesting seeing just what has changed on site in the two-and-a-half weeks since I was last here. In some areas the ground level has dropped considerably, in others the patterns of stone and earth have shifted in ways my untrained eye can detect but not fully understand. I was lucky enough to get a peek at some of the amazing finds that have come out in recent days – beautiful objects! I’ve been able to say hello again to some familiar faces, whilst others are new. As always, the Orkney weather is showing it’s many faces. In the past, I have been known for my paintings of monumental landscapes, especially standing stones and stone circles. Over the last year or so, however, my work has become increasingly concerned with what lies under the ground as well as above, and I’m interested in exploring modern archaeological practice. Jordan records the positions of all his XRF samples in Structure Eight. 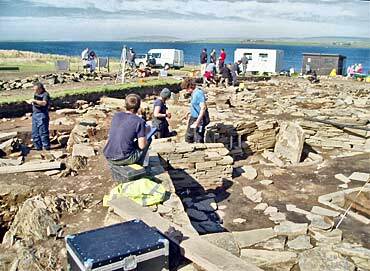 For me, spending a concentrated time at the Ness of Brodgar site means spreading my attention between the people, the visitors, the finds, the ancient decoration and art, as well as the “landscape” of the site itself. I’m quite interested in what I call “intended patterns” (inscribed stones, for example) and “unintentional patterns” (such as the way a spread of stones appear, perhaps the top of a wall or a floor surface, as they are uncovered from the earth). When I first arrived on site, I was unexpectedly taken with the diggers themselves, the body shapes people throw when excavating or planning – knees at ears, feet under bottoms, curved backs with hidden heads…. I’m not usually a figurative artist, so this was an interesting and different direction for work. Today, I’ve been taking macro shots of some of the more recently found incised stones – lattice patterns, delicate waving lines and peck marks. Back at the studio I’ve just begun the job of creating some abstract paintings using some of the common motifs. I’ve been trying to record some of the sounds of the site today too, although I’m not sure if the kit I have with me is quite up to the job with the ever-present wind! I’ve been working on a piece of sculpture which I plan at some point to install on site and photograph, but I admit just now I’m suffering a little stage fright, so I’ll need to see if I’m brave enough to bring this 2m high structure out of the boot of the car, where I’ve just about managed to wedge it! I must say everyone at the site has been amazingly welcoming, and very patient with my peering over their shoulder for a picture, or painting their bottom in the air as they dig. Everyone is so keen to share knowledge. They will, however, get the last laugh as I’ve just volunteered to help with the sandbags and covering of the site next week – they can watch me sweat for a change!